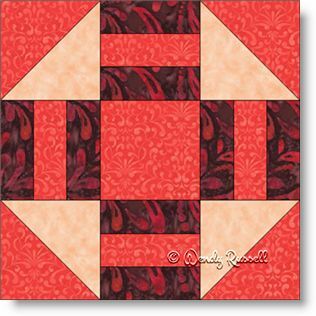 The Golden Gate quilt block is a wonderful choice as your first project if you are a beginner quilter. This block contains only simple shapes -- the square, rectangle -- and the most commonly used quilt patch -- the half square triangle. Although I have chosen to use only three different fabrics, this nine patch quilt block would be great as a selection to use up many scraps you have collected, especially if you are creating a whole quilt of this one block. The sample quilts illustrated feature sashing to divide the blocks from each other as well as extra blank squares to feature your quilting design(s). You might come up with many other ideas on how to lay out your own person quilting project.